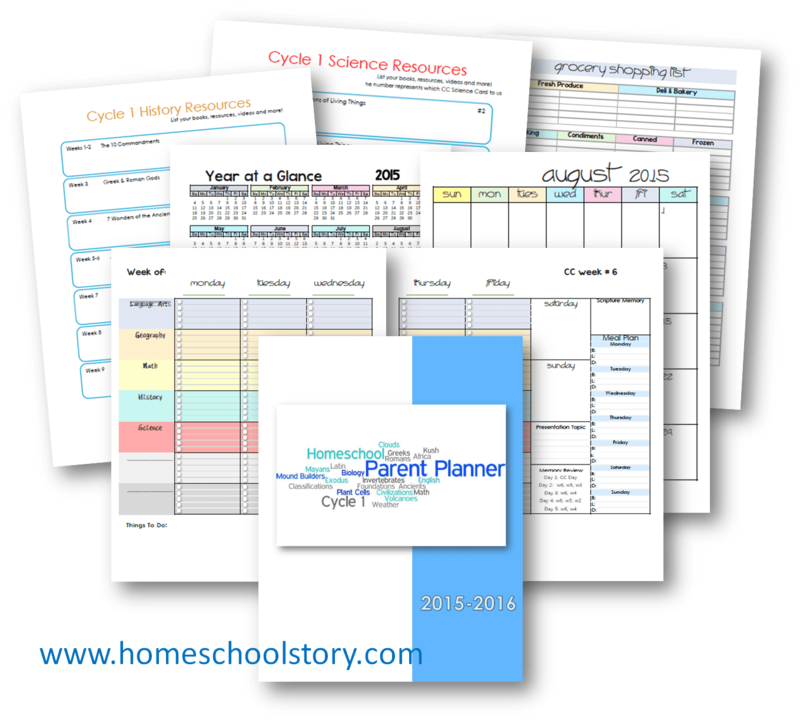 After lots of hard work and a crazy few weeks, the Cycle 1 Parent Planner is finally here! For those who don’t know, I’m currently on bed rest with PIH (pregnancy induced hypertension) and mild-preeclampsia! You would think that I’d have all kinds of time lying here with my laptop, but even from my spot on the couch, there is just so much to do! Plus with the recent increase of BP meds, it’s hard to stay awake! Those things really knock me out! I was overjoyed at the response to the Student Foundations Planner that I couldn’t wait to finish the Parent Planner…but in the middle of all that, I had a baby shower at my house (since I was on bed rest we figured it would be better to have it here). Of course having it here made me want to help and I ended up getting up and helping way more than I should have…which then led to me being pretty much incapable of using my brain for a few days. But the shower was beautiful, and I loved seeing all my friends and family that I’ve missed these last 8 weeks on bed rest! My sister always throws the best showers! 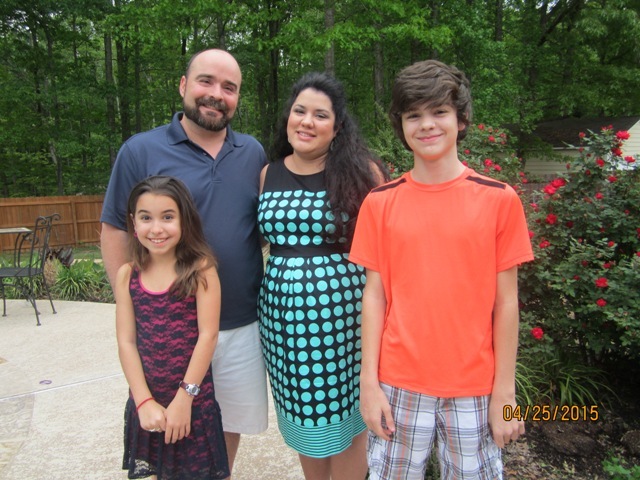 The next weekend (this weekend) was my daughter’s 10th birthday! Again, I was determined to celebrate with her as much as I could and we went out yesterday and then to dinner today. I was wiped out and totally swollen by the time I got home to finish editing and uploading this planner! Which is why it’s now Sunday and I’m just finishing up. My family! This was after the baby shower and I was all swollen and feeling very tired! In between, I’ve been finishing up Challenge A with my son, doing some light school work with my daughter, and trying to buy all the rest of the baby things we need by shopping online! When you end up pregnant 10 years after you thought you were done…you kinda need everything again! Oh… and planning my husband’s 40th birthday party! Needless to say, it took a little longer to get this planner done, but I think you’ll enjoy it. I tried to keep it simple, but useful. Subjects: I’ve listed subject headings for Language Arts, History, Math, Geography, and Science. Check Boxes: Each subject row has 5 check boxes. This can be for individual assignments or divided up among different children. Scripture Memory: I thought about dividing up the Exodus memory work and putting it here, but many communities divide up the Bible memory a little differently than others. Use this space to write out your Exodus Bible memory or any verses you want to focus on each week! Presentation Topic: Okay so this box is just for me! I know I am the only one who, after 6 years of CC Foundations, can still forget EVERY week about presentations! I added this box to keep reminding me to help my children prepare for presentation! Meal Planner: Personally, I’m not naturally very good about meals. If I don’t plan out breakfast, lunch and dinner we just won’t have the right groceries at home to make yummy food. 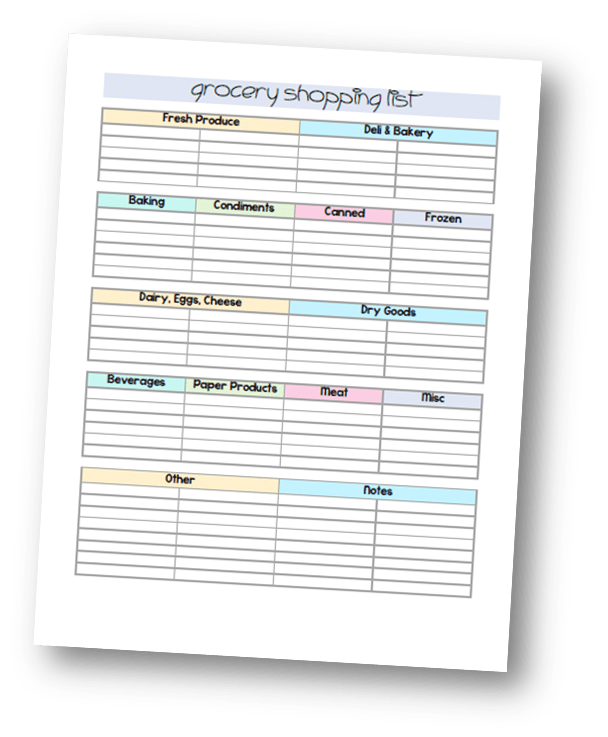 I love planners that include meal planning, so this is for all of you who like to plan and shop ahead! 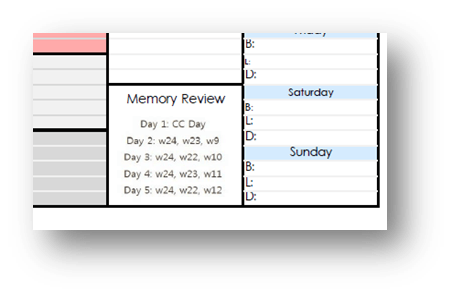 The “famous” Memory Work Review System that I’ve created is now built right into the Parent Planner! I’m so excited about this! Each week you will see a little box that has the image straight from the Memory Work System cards. It will tell you which CC memory work to review each week. 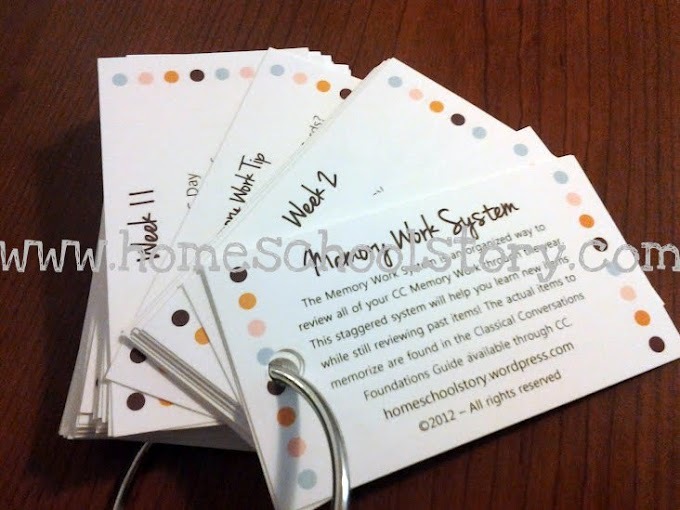 If this system is new to you, basically it gives you a systematic way to review current and past weeks’ memory work in just a few minutes a day! 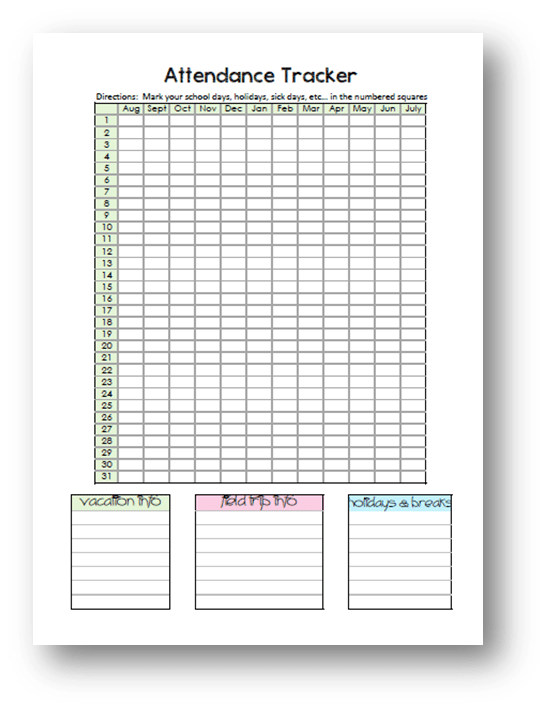 The card system is still available as a pdf download for $4 or as a pre-made laminated set for $15. I like to have the cards and the planner. The planner is great for at the school table, but the cards are great to keep in the car or on the go! Plus…the planner does NOT contain all the cards! The planner only contains the weekly review system. It does NOT contain the Memory Tips, Summer Review, Memory Master Review, Winter Review cards. If you want those cards, please order the complete set. If you are like me then you use CC as your main curriculum. That means that you plan your history and science studies each week around the CC topics rather than following a different curriculum or schedule. 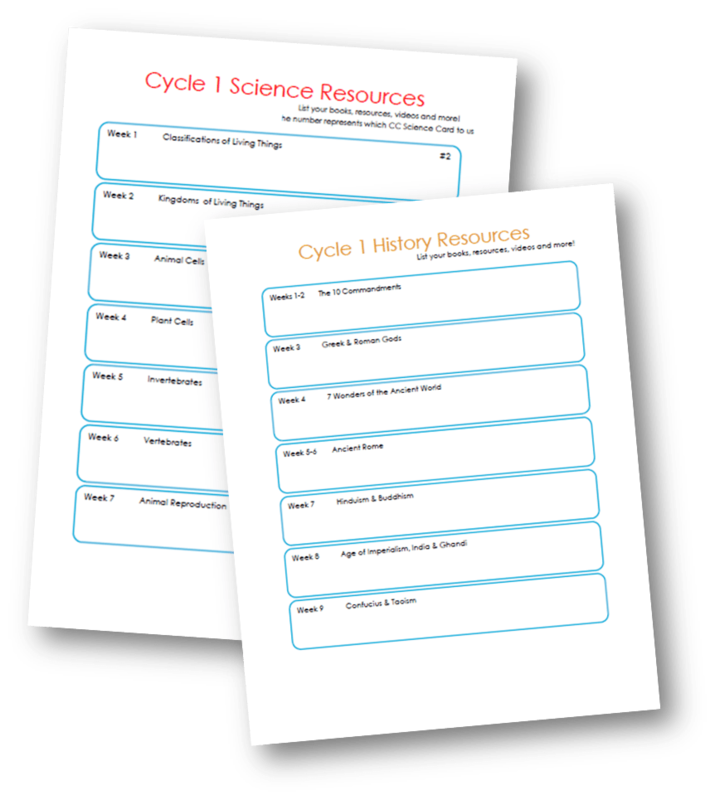 I’ve included planning sheets for both history & science for you to use! You can use this space to brainstorm ideas, jot down book titles, website addresses, names of crafts or activities, or even field trip ideas! There are TONS of blogs that offer reading lists for each cycle…like this one from Brandy at Half a Hundred Acre Wood. Use those lists and pick out what you plan to use. Since I can not write out the CC memory work (that would violate copyright laws) I can only give a general topic header for each week. You will find that it’s enough to give you an idea of what to study. UPDATE: The topic header is now also blank due to concerns with copyright. Just use your Foundations Guide and plan out each week! No biggie at all. 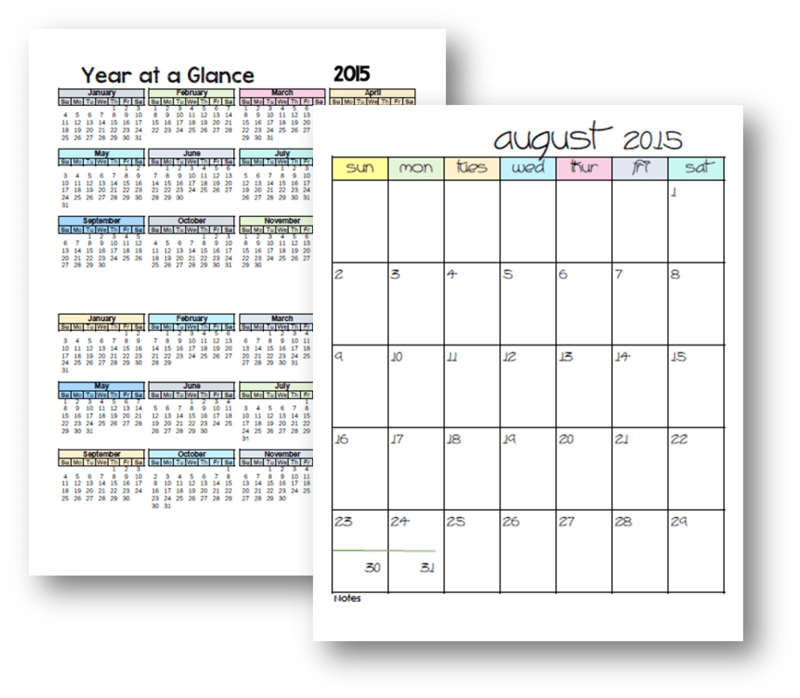 This planner includes a Year-at-a-Glance page as well as monthly calendars. I’ve included 12 months running from June 2015 – May 2016. To go along with the meal planning section, I’ve included a handy-dandy Grocery Shopping List. I love using lists like this because it separates the food by section or type! Especially handy when you’re sending your husband or someone else to shop…this has become my life while on bed rest! This planner will normally sell for $15. It’s a great deal since my Memory Work System is $4 for pdf and $15 for printed version…and it’s included here!! For the first couple weeks, this planner will be on sale for $10! 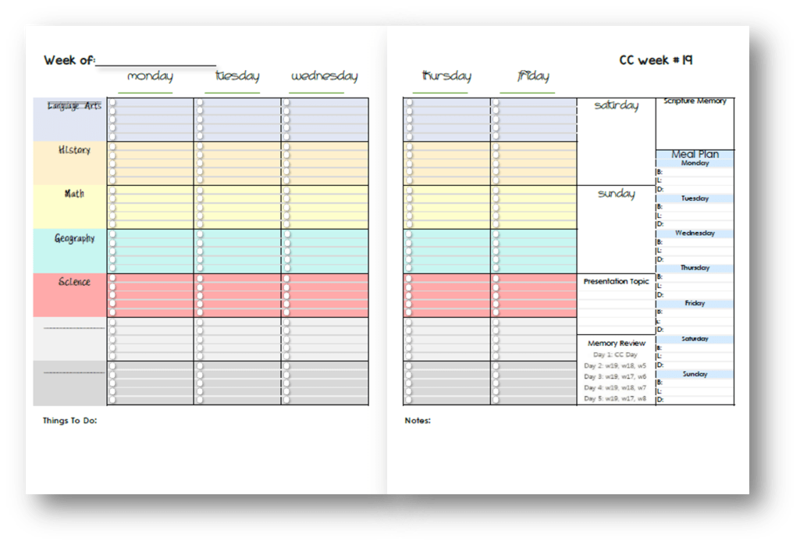 Don’t forget about our great Foundations Cycle 1 Student Planner and our range of CC Challenge Planners! From your description, I can’t tell — is this a planner just for the 24 weeks of the CC schedule or do you include “extra” weeks in between so we can customize for 36 weeks or even year-round? Trying to figure out what I want to use to organize our weekly plans for next year. Thanks! Are there weekly planning pages beyond the 24 CC weeks? for the rest of our school year that doesnt include CC? THKU! Appreciate your work and time on this wonderful shared resource. Beautiful. I am wondering though…are there only pages for 24 weeks of the weekly review pages? Though we use CC as our core, we always have a few things that end up falling outside those 24 weeks of CC. Curious as to whether I would need to print out more of the weekly pages. Thanks! Does this planner only go 24 weeks or does it go longer into a full school year ???? And CONGRATS on the new baby ! I also had a baby last year with a teen and a pre-teen in our house. . .. .10 years after we thought we were done. People thought we were NUTS but I am SOOOOO excited to be a baby-momma again, even though she has some special needs .. . . . The Grammar Stage planners (formally called Foundations Planners) do have 24 weeks, but they also have a blank week that can be used to extend your school year as you need! I hope your little one is doing amazing! It’s been a big adjustment for us but we are happily celebrating his first birthday this weekend!! I purchased your planner and I’m looking for info. on how you print it? I assume if you have it printed as double sided that will work…? I know this is an old comment but let me answer in case others have this question too! Yes, there are directions with each planner on how to print double sided. Any of the CC Foundations planners are now called Grammar Stage planners! This year’s planners are now available!